Did you manage to guess last weeks CAN YOU NAME THIS CREATURE? …. I got two correct answers… from Dave at The Wedding Artist and from Michael at Nature Learn; Well done because it was a tricky one I thought. So what was it? 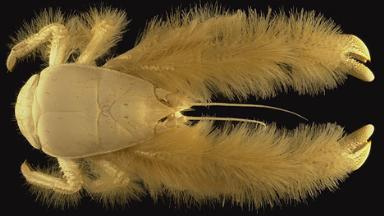 It was a YETI CRAB (Kiwa hirsuta)… a deep sea crustacean newly discovered in 2005. These wonderful looking creatures are deep sea dwellers. The are found on the ocean floor off Easter Island. It is thought that the “fur” on their legs might actually trap bacteria given off by hydrothermal vents. In 2006 another species of yeti crab (Kiwa puravide) was discovered off the coast of Costa Rica, living in deep methane filed fissures. Bacteria were also found on the silky hairs of the Kiwa purivida and it is thought that the crab literally farms the bacteria on the hairs of it legs, feeding them, maintaining them and ultimately harvesting and eating them. It is likely that bacteria on the Kiwa hirsuta arrive at a similar fate! Farming food on their own bodies…another marvel of nature! ← Thought of the day…"A bee in my bonnet!"